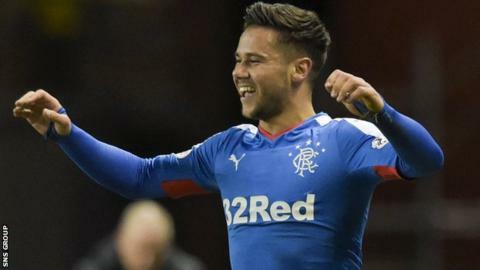 Rangers are on the verge of a new deal for Harry Forrester as they close in on the Scottish Championship title. The 25-year-old midfielder has scored five goals in his last seven appearances since agreeing a six-month contract in January. A win over Dumbarton on Tuesday would seal promotion and the Ibrox side want to retain the services of the player. "We're very close to Harry Forrester committing his long-term future to the club," said manager Mark Warburton. Forrester, who scored in Saturday's 3-3 draw with Raith Rovers, arrived mid-season from Doncaster Rovers, having played under Warburton at Brentford. Meanwhile, Warburton says his side "have to be tighter and harder to beat" after conceding three goals in each of their last three games. Leading 3-2 at Stark's Park, Rangers were on course to clinch the league on Saturday but lost a late goal to Raith. "We were very impressive up to that point and there is no doubt we have conceded nine goals in three games, which is unacceptable," said Warburton. "But again, sometimes you can over-analyse. "The first goal at Falkirk [in the recent 3-2 defeat] was a wonder strike into the top corner, and on Saturday the first goal took a 90-degree spin and the guy hit it on the full with a screaming volley. [Goalkeeper] Wes [Foderingham] had no chance. "They were two magnificent goals. If you are beaten by those wonder strikes, then that's the random nature of football. "Nine goals and not one headed goal against us, so there is not an aerial threat that we are exposed to. "We are looking at what we can do better, and we have to be tighter and harder to beat, that's for sure. "But I don't think there is one area that we are exposed on at the moment."